"This protein power-packed breakfast is fairly easy to prepare and great for anyone on a healthy-eating, high-protein low-carb diet. You can sub just about any veg, like spinach, onion, tomato, etc." Heat olive oil in a skillet over medium heat; cook and stir kale, mushrooms, salt, and pepper until until mushrooms are tender, 5 to 10 minutes. Whisk eggs, egg whites, and milk together in a bowl until frothy. Spray a non-stick skillet with cooking spray and place over medium heat; cook and stir egg mixture until cooked through, about 5 minutes. 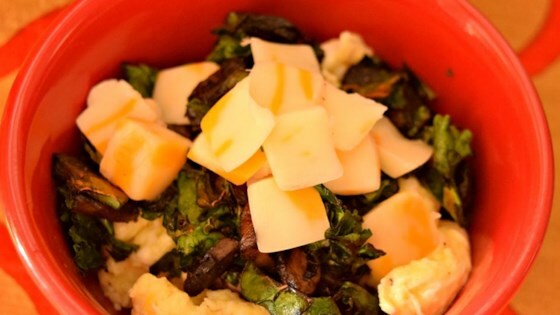 Transfer eggs to a plate and top with string cheese and kale mixture. Garnish eggs with Sriracha and parsley. Salt-free seasoning can be used in place of the salt and pepper if desired. Coconut oil can be used in place of the olive oil, if desired. Easy, yummy, healthy. Will make again. Next time instead of dirtying 2 dishes after sauteeing the mushrooms and kale I'll add the eggs into that pan.